A container garden is especially good for kids. Kids love having things in pots. 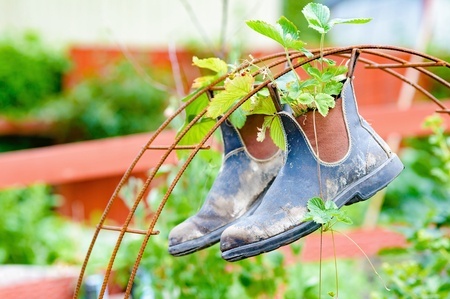 Anything from old boots to toys can be a container for your kids' planting adventure. And to make it even more fun for them, let them create their own pots. Let the kids pick out a collection of pots of various sizes and shapes. Maybe they could plant a strawberry pot with different little plants in each of the holes. Or they could even make their own containers for their very own container garden. Old sneakers and boots make great whimsical pots. You could even have a shoe-in with all different types of shoes. Anything can be a container. It just has to be able to hold soil and allow excess water to drain out the bottom. We've used everything from old sneakers to work boots to plastic soda bottles cut in half and painted with flowers or butterflies or hearts. The more unusual, the more fun. Just remember that these pots dry out faster than clay or plastic and will need frequent watering. Watering is the prime drawback of container gardening because container plants dry out much faster than the in-gound variety. You might want to consider hooking up a little irrigation line running from pot to pot so toucan go on vacation without suffering any casualties. Decorative cinder blocks. Herbs especially like these containers. They like tight places for their roots and the lime embedded in the blocks. You can set a bunch of them out to make a pattern and create a shallow garden. Old toys, such as plastic dump trucks, etc. Pocketbooks and totes. These are terrific for taller, larger plants. Baskets. What did you do with the Easter baskets?! Find them if you can, and fill 'em with soil and let the kids loose with the seeds or seedlings. Shells. A great choice for cactus and succulents. Wash out the container. Put holes in the bottom for drainage. Fill the container full of potting soil. Leave around an inch at the top if you're scratch with seeds; about two or three inches if you're planting seedlings. Plant seeds and cover. Or, plant seedlings and gently cover their roots with soil. Gently press soil over roots or seeds. Water gently so you don't wash all the soil out. (This is not the time to power spray.) Wait until all the water has settled; then water more. Repeat until water drains out the bottom holes. Check for sinking soil levels. If the soil level sinks down after the first watering, add more soil. Keep soil moist for seeds. If you're planting seeds, you'll need to keep the soil moist until the seeds sprout. Fertilize. Once a month should do it. Smaller plants work better than big ones. Succulents and cactuses are great choices because they don't require much root space and they don't mind drying out between watering. If you cluster your containers, they will look nicer and be easier to water. A layer of tiny pebbles (or aquarium gravel) on top of the soil will help keep the soil from washing away during watering. Happy container gardening with kids!